Lyme Disease is caused by an organism called Borrelia Burgdorferi, which is carried by Ixodes (Blacklegged) ticks. Dogs living in the Northeast, Upper Midwest, and Northern California have the greatest risk, but any dog bitten by an Ixodes tick could be infected. A tick must attach to the dog for around 48 hours in order to transmit the Borrelia to the dog. Cats can get ticks, as well, but do not get sick from Lyme Disease even though the bacteria can technically infect them. Ninety-five percent of exposed dogs have no symptoms. The other five percent can have fever, anorexia, depression and arthritis which causes swelling and lameness that shifts from leg to leg. 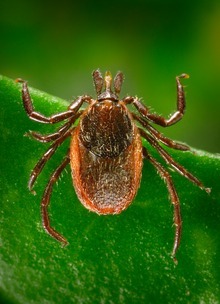 Lymph nodes near the tick bite may be enlarged. Rarely, dogs can have kidney failure, heart, skin and neurological problems. There are multiple blood tests which can be done to see if your dog has antibodies to Borrelia, but sometimes the antibody levels are too low to detect. Better tests are being developed. Some dogs are diagnosed without testing, based on their symptoms and history of tick bites. It usually takes 2 months or longer after the tick bite for symptoms to appear. Certain antibiotics are given for at least 4 weeks in dogs suspected to have Lyme disease. Infected dogs respond very well and usually start feeling better in just 1-2 days. 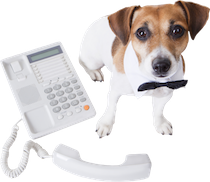 Once treated, dogs do not have recurring problems like humans do. Dogs who have Lyme symptoms should be monitored for possible kidney issues. There is no reason to give medications to dogs who test positive but have no signs of the disease. All dogs living in high risk areas of the country should receive the Lyme vaccine at 9-12 weeks of age, then a booster 2-4 weeks later, then annually in the spring before tick season begins. Vaccination may also be a good idea when traveling to a high risk area. The easiest way to prevent Lyme Disease and at least 5 other tick borne infections is to prevent exposure to ticks. Multiple species of ticks can transmit disease. There are many over the counter and prescription products available for tick control on the dog, in the form of collars, tablets and liquid medications which are applied between the dogs' shoulder blades. Some work better than others, so consult your veterinarian before choosing a product. Even though clinical Lyme Disease has not been seen in cats, using cat-safe tick preventatives on cats in high-risk Lyme areas is advised. It is also important to avoid the areas where ticks live, like dead leaves, low vegetation, overhanging branches, overgrown lawns and wooded areas. And don't forget to check your dog daily to remove ticks before they have time to transmit disease!